The mass media plays an essential role in providing accountability both at the government and corporate level. There is ample evidence that in democracies the traditional mass media – such as TV, radio, and newspapers – serve as an important instrument for monitoring the behaviour of public officials and limiting corruption (Strömberg 2004, Besley and Prat 2006, Snyder and Strömberg 2010). Recently, social media such as Facebook and Twitter have quickly become an important alternative source of information for citizens, as low entry barriers make it much easier for civic activists and ordinary citizens to share information about wrongdoings by public officials or corporate leaders. However, there are concerns about the reputation and quality of individual blogs, as well as about the ability of interested parties to manipulate social media content. These concerns make it unclear whether or not social media can have a real impact on political and corporate accountability. In a recent paper, we focus on the case of an influential Russian blogger to demonstrate that an anticorruption blog can have a measurable, sizable impact on accountability (Enikolopov et al. 2016). Specifically, we show that blog posts by Alexei Navalny, a popular blogger, shareholder activist, and future (at the time period covered in our study) prominent opposition leader, were affecting the stock performance of companies whose wrongdoings he exposed. Moreover, these posts were associated with an increase in accountability within the targeted state-controlled companies. Alexei Navalny began blogging about corruption in state-controlled companies in 2008. The popularity of Navalny’s blog surged after he launched the Rospil project, which focused on protecting minority shareholders of large state-owned companies and, by extension, the management of taxpayers’ property by the Putin government (Healy and Ramanna 2013). In one of his most famous posts, Navalny questioned the charitable spending of Transneft, a Russian transportation company that owns the largest oil pipeline in the world and transports more than 90% of Russia’s oil. In 2008, the company spent more on charity than on capital investments, but it refused to reveal recipient charities. Navalny contacted a number of leading charity organisations in Russia, none of which reported receiving donations from Transneft. This story attracted much public attention, and in 2011 Transneft started disclosing recipients of its charity donations. Since the blog posts of Navalny became mostly political starting in the autumn of 2011, we focus on the period between January 2008 and August 2011, when Navalny’s blog was devoted almost exclusively to the issue of corruption in state-controlled companies and when Navalny was not yet considered a major political figure. The data shows that Navalny’s blog posts had a significant negative effect on the stock performance of the companies he was mentioning in the posts. Figure 1 demonstrates how the stock returns of the companies mentioned in Navalny’s posts went down within three hours after the posts were made. The magnitude of the effect is substantial, amounting to a daily effect of 0.5%, with some focussed posts (mentioning a certain company at least five times) having an effect of 1.1%. These effects are comparable with the average effect of the quarterly report announcements for these companies (2%). Note: The figure shows five-minute cumulative abnormal returns around Navalny’s blog postings, with timing of the blog posts normalised to zero. Only blog posts with at least five mentions of a company are included. 95% confidence intervals are in light grey. Trading day, hour, and company-month fixed effects are controlled for. Non-trading time (evenings and weekends) is excluded. Posts with preceding mentions of companies in online or offline media are excluded. How can we be sure that the results reflect the causal effect of blog posts on the performance of state-controlled companies, rather than a strategic timing of the posts? Theoretically, it would have been possible that Navalny timed his postings as a reaction to changing share prices of the companies. We used distributed denial of service (DDoS) attacks as a source of exogenous variation for the timing of the posts. These DDoS attacks did not specifically target Navalny’s blog, but they affected the accessibility of the entire blogging platform for at least several hours. As a result, the blogger was unable to post, while other users were unable to read his previous postings. Comparing the days with DDoS attacks, during which Navalny was unable to write because of exogenous reasons, with companies’ performance on the days when the blogger voluntarily chose not to blog about them reveals no differences in the performance of the targeted companies. 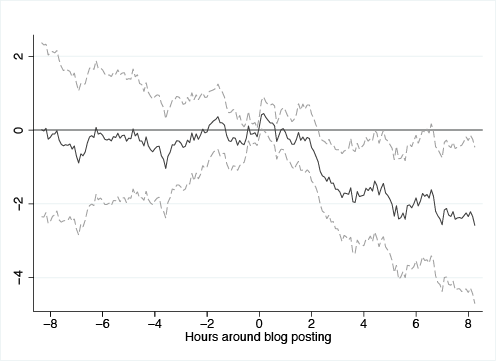 Thus, there is no indication that posts were strategically timed, and thus the results can be interpreted as reflecting the causal impact of the blog posts. We look at the performance of long-short portfolios constructed using the mentions of companies in Navalny’s blog posts. Consider zero-cost portfolios constructed by going short one unit of capital at the start of each calendar month on all stocks of companies that were mentioned in an important Navalny post in the previous quarter, and going long one unit of capital on all stock of companies in a comparison groups about which there were no blog posts by Navalny in the previous quarter. As long as Navalny’s posts have long-term effects, these portfolios should perform better that the market. 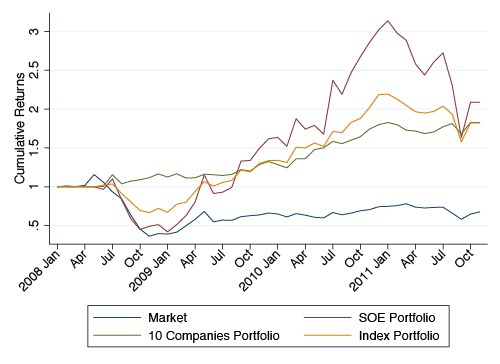 The results in Figure 2 show that such portfolios indeed substantially outperformed the market over the entire time horizon of our study (three and a half years) for three alternative comparison groups. Thus, the effect of the blog posts is not limited to short-run fluctuations in stock prices, but has long-term consequences. Note: The figure plots cumulative returns over the sample period of zero-cost trading strategies that on the first day of each calendar month go short one unit of capital across all stocks of companies that were mentioned in Navalny’s blog in the previous quarter and go long one unit of capital across all stock of companies in a comparison group, about which there were no blog postings by Navalny in the last quarter. Three alternative comparison groups include: (1) all the firms included in the MICEX stock index; (2) all the state-owned companies included in the MICEX stock index; (3) ten companies Navalny wrote about. Portfolios are equally weighted. For comparison, we include the cumulative market excess returns. In practice, there is a number of channels through which blog posts can affect stock prices. Stock prices might react to the information made available to the investors, without any corresponding change in firms’ behaviour. If this is the case, the negative effect of blog posts reflects the fact that investors learn that companies divert more money than they expected, so that they revise down the expected cash flows to stock holders. At the same time, blog posts might affect prices by changing the behaviour of the companies. By attracting public attention to corporate violations, they can force management to improve corporate governance and reduce the amount of diversion, which will, eventually, have a positive effect on stock performance. The results indicate that the magnitude of the negative effect of blog posting diminishes when the blogger becomes more popular, or when particular blog posts are shared more frequently on other social media through retweets and reposts. This finding contrasts with the previous studies in finance that find the impact of traditional media to be stronger when the audience of media messages is larger (e.g. Engelberg and Parsons 2011, Peress 2014). However, it is consistent with the observation that a greater attention to blog posts makes it more likely that the profit diversion will decrease in response to these blog posts, counterbalancing the ‘negative information’ and ‘attention’ effects. In line with this argument, we also show that companies are more likely to have management turnover and are less likely to have shareholder conflicts following the blog posts targeting them. Taken together, the three sets of results (long-term impact of posts, interactions with popular indices, and changes in companies) suggest that social media play an important and positive role in improving corporate accountability, leading to less profit diversion and corruption in politically connected companies. Previous studies have shown that although publications in the international press about corporate governance violations in Russian companies do increase the probability that these violations were redressed, similar publications in Russian-language media outlets did not have any effect (Dyck et al. 2008). Our results demonstrate that an individual blogger with a zero initial popularity has been able to become more influential than most popular business newspapers in a time-span of three years. On a more general level, this tells us that social media can increase accountability in a country with limited political competition and censored traditional media.